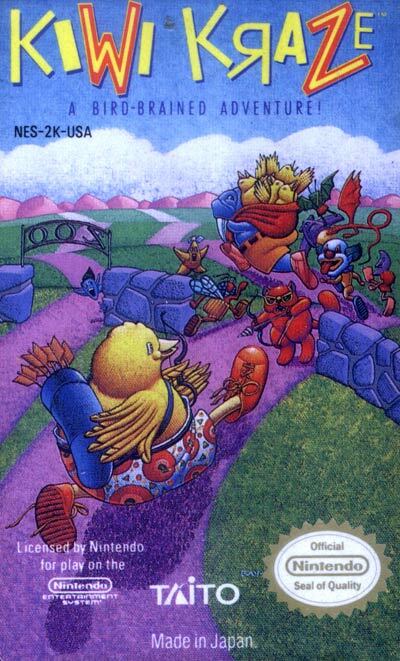 The New Zealand Story (also known as Kiwi Kraze in its American NES version) is a 1988 arcade game by Taito. The player controls a sneaker-wearing kiwi chick called Tiki, and the aim of the game is to rescue several of his kiwi chick friends who have been kiwi-napped by a leopard seal. At the end of each level, one of these characters is released from a cage. Like Bubble Bobble, letters can be collected to spell out "EXTEND" for a bonus. However, levels scroll rather than being stationary. The weaponry starts out as arrows, but pickups can change these into bombs, lasers, or bouncing fireballs. These act a little differently, and what is useful depends upon the player's location. A distinctive feature of this game is the ability to ride a variety of flying vehicles, ranging from balloons to a UFO armed with either laser or guided missiles. Vehicles can be found ready for use or can be stolen from any enemy. Other features include the many secret areas and shortcuts hidden throughout the game, as well as a special "Heaven" round where the player goes after losing their last life (though only if the player dies by getting hit by an arrow to the head, no other "death" will activate the "Heaven" round), actually having a chance of escaping and continuing the game "on Earth".